You can write about yourself and your past year in your student portrait. You can personalize your own portrait with audio, video and photographs. You can also join a buddy network and send signatures to your best friends. 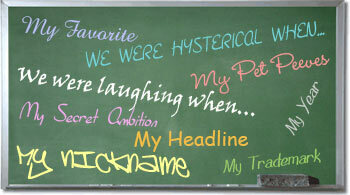 Express yourself with your favorite memories, funny stories and personal insights. It’s yours to create…yours to enjoy! MyYearbookBuilder eYearbooks come to life as the entire school becomes actively involved in the production process, contributing memories, emotion and personality. Photo-tracking allows students to track photographs of themselves throughout the yearbook, above and beyond their own submissions. Students tag photographs with their name or the names of their friends in the photograph, so that they and their friends can follow all their photographs in the yearbook. Photo-captioning allows photograph owners the opportunity to add brief descriptions or comments to photographs. It’s your photograph, your memory…tell your story!